Here is a fun project to make for a friend! Pre-made brownie mix that is great to give to someone for any holiday! 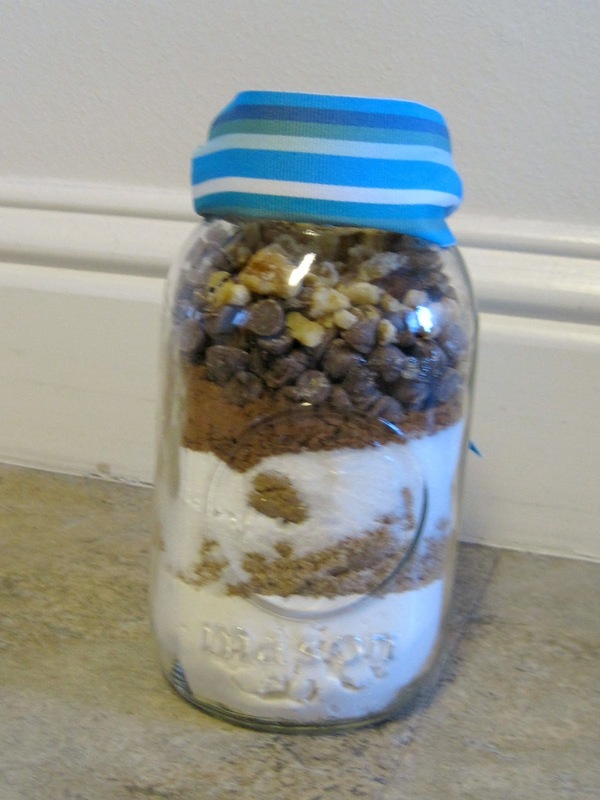 Just add all of the dry ingredients to a mason and then add the additional ingredients and directions to a little card and tie it to the jar. The brownies taste great too! Pour the flour into a 1-qt. glass container with a tight fitting lid. On top of the flour, layer the brown sugar, salt, sugar, baking powder, cocoa, chocolate chips and nuts. Do not mix. Cover and store in a cool dry place for up to 6 months. To prepare brownies: In a large bowl, beat the eggs, oil and vanilla. Stir in the brownie mix until well combined. Spread into a greased 9 inch square baking pan. Bake at 350 degrees for 34-38 minutes or until a toothpick is inserted near the center and comes out clean. Cool on a wire rack. Makes 16 brownies. This looks great! I pinned it to one of my food boards. A great gift for a young busy mom! I love gifts that come in jars that you can eat :o) Thanks for linking up to Tasteful Tuesdays! love it! Really appreciate you stopping by my blog! I’m trying to keep in better touch with my linkers/readers… If you already follow me, please let me know I will find your blog on Bloglovin (I’m transferring my follows there)if you don’t follow in any way, would you consider following via GFC or other method? Thank you for stopping by, I pinned this. See you next week.